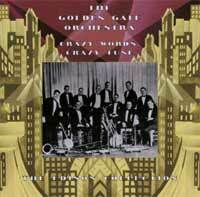 More “Unissued Edison Recordings” from Larry Tedder – The forth volume in the series being issued by Document Records from England under the banner The Edison Collection – Crazy Words, Crazy Tune - consists of 18 sides recorded by The Golden Gate Orchestra from 1925 though the Edison Company’s last year of operation in 1929. A few of these were released on Diamond disc and in very limited quantities as Needle-cut Laterals, but the rest remained in the storage room in West Orange, NJ until audio engineer Merritt Malvern transferred them to tape in the 1970s. Tedder, a collector in Texas, now owns the tapes and has remastered them for this series. The liner notes this time are by Document’s owner Gillian George who gives a brief background of this all-White “jazz band”. The songs are the standards of the day – “The Charleston”, “ Ain’t She Sweet” and a few of the schmaltzier dance tunes – and the performances are not much different than those released on the dime store labels of the day. The songs are tuneful but there is so much more on the Malvern tapes that could have been issued sooner than this package.